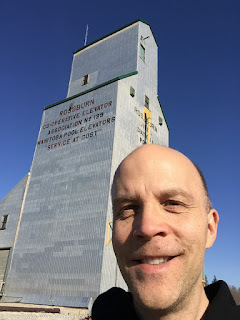 On April 30th I set out on my last marathon Manitoba grain elevator trip. I had about two dozen elevators left to photograph, and this trip would get all but one of them. I did my planning and on the evening of April 29th, I was ready to go. My camera was charged, I had a zillion podcasts on my phone, and my wife thought I was crazy. She might be right. My alarm went off at 3:00 AM and I jumped out of bed. OK, maybe I just rolled out of bed. After a quick shower and breakfast of toast and milk, I was off. 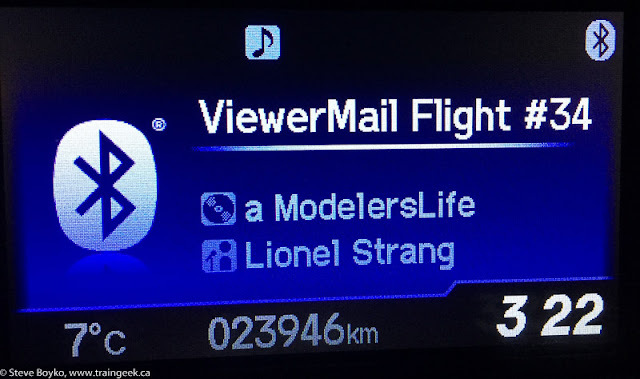 First up on the podcast list was A Modelers Life. With one "L" (inside joke). 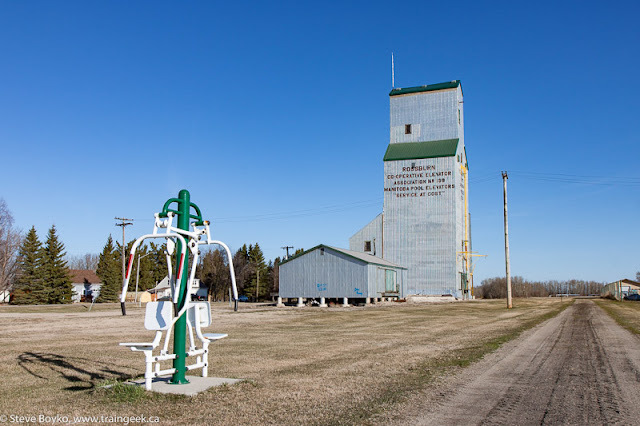 I hit the road, headed west to Portage la Prairie then up highway 16 through Gladstone. 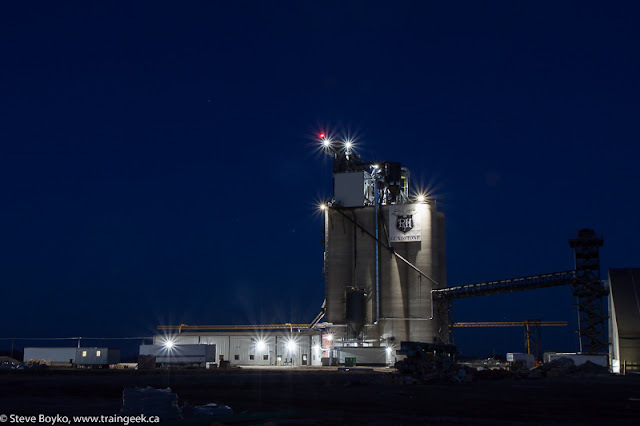 As I approached Happy Rock Gladstone, I decided to take a few minutes to photograph the new Parrish and Heimbecker grain elevator on the CN Gladstone sub just off the highway. I took a side road and set up my tripod for a long exposure shot. 30 seconds did the trick! That was my first new grain elevator.. not planned, but I'll take it! 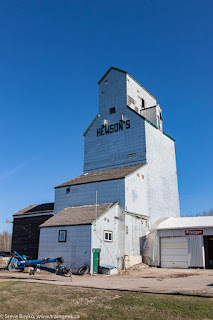 After grabbing some breakfast at McDonald's a Scottish restaurant in Neepawa, I carried on through downtown Minnedosa, then headed north on highway 262 to Clanwilliam, the first on my list. When I arrived at 6:19 AM, the sun was above the horizon but not quite above the trees yet. 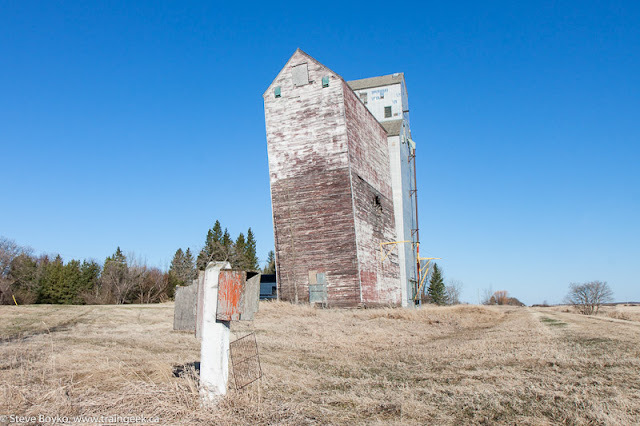 The elevator sits alone on Railway Avenue (of course) and is no longer in use. I understand it was last used 6 or 7 years ago. The CN Rossburn subdivision used to run between a point near Neepawa and Russell, but all that was abandoned back in 1996. 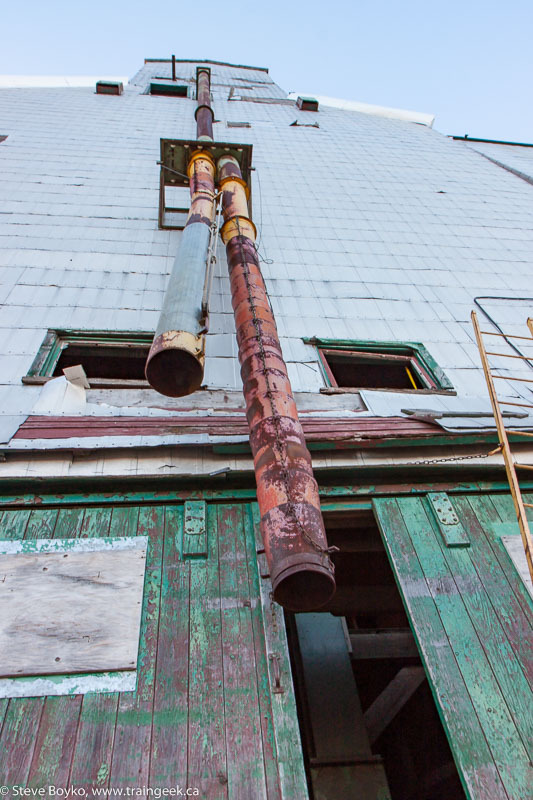 This elevator has two discharge pipes on the railway side. Any guesses why there are two? 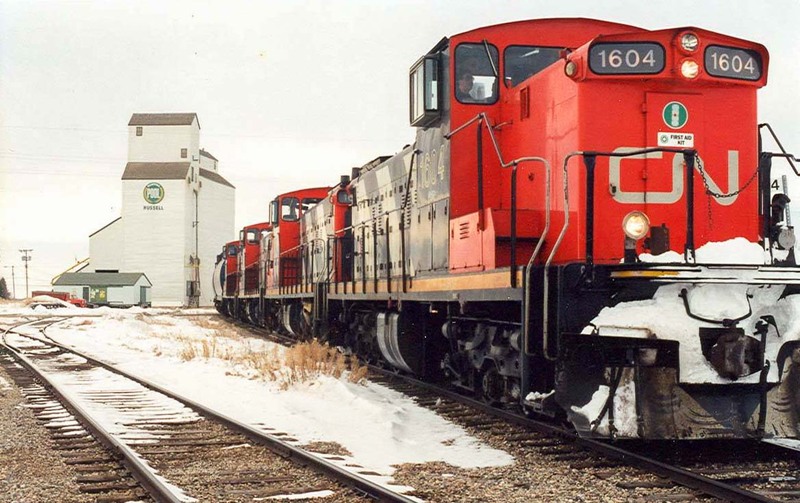 There are two because the longer one was for loading grain into the (side) door of grain boxcars and the shorter one was for loading into the tops of grain hoppers. Simple, right? The elevator is not in great shape, but certainly better than some I've seen. The grain elevator in Sandy Lake dominates the skyline, as elevators often do. It helps that it is up on a ridge, above the cottages and houses that dot the shores of the lake. It turns out that Sandy Lake's elevator is privately owned by Lewandowski Farms. Lots of interesting piping here! Just for fun, I recorded a short walk-around video. By this time I was running behind schedule... the elevators were just too interesting, I guess! I resolved to try to pick the pace up. A milepost! Oakburn's siding was mile 65.6. There was another milepost still existing on the other side of Oakburn too. I was here in late 2014 so I didn't linger very long. The annex doesn't look like it is leaning any more. 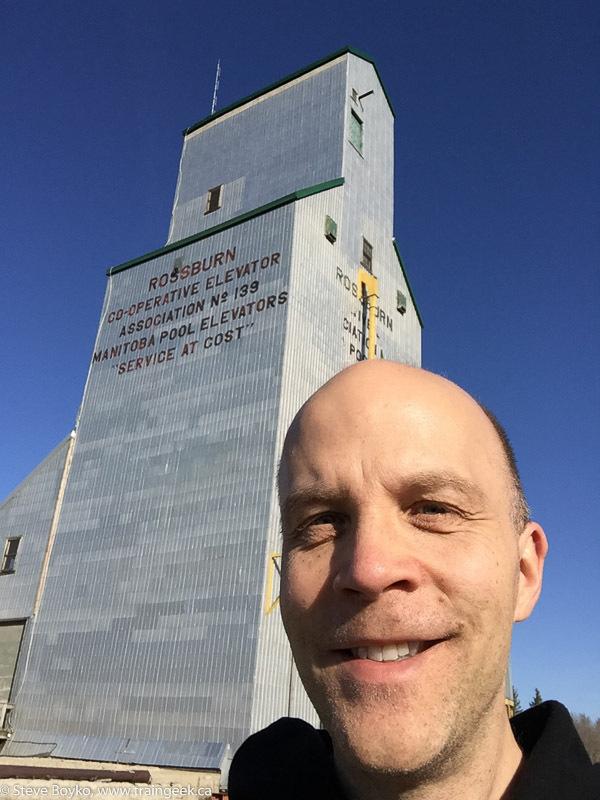 I drove past Vista - which used to have a few grain elevators - and on to Rossburn, namesake of the subdivision that used to go through here. The Rossburn grain elevator is located in the heart of the town. It looked to me like it is still being used. I was impressed by how bold the lettering is on the elevator... no wear at all. I wonder if they were reapplied recently. I had to take a selfie here. I was taking one or two photos of each elevator with my iPhone, just in case I had problems with the SD card in my camera. I'm paranoid that way. At this point it was 8:40 AM and I had been up for close to 6 hours. Go caffeine go! I was taking pictures of the Ukrainian churches that I found, like I did last summer. I'll publish them in a separate post later. 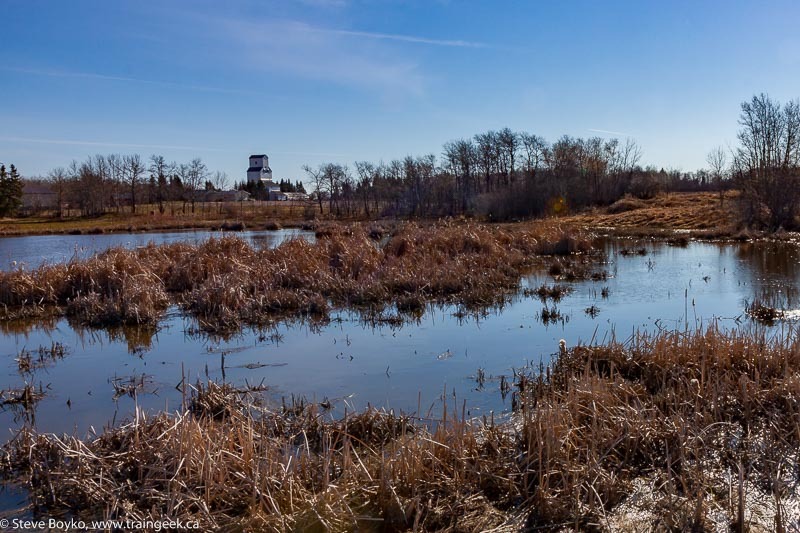 After photographing Rossburn, it was on to Birdtail. I punched the GPS coordinates into my phone's map application, as I had been doing, and went on my way. I hadn't been 100% sure that there was still an elevator at Birdtail. There was no Street View available and the satellite view of the area was old. Still, a little disappointing. 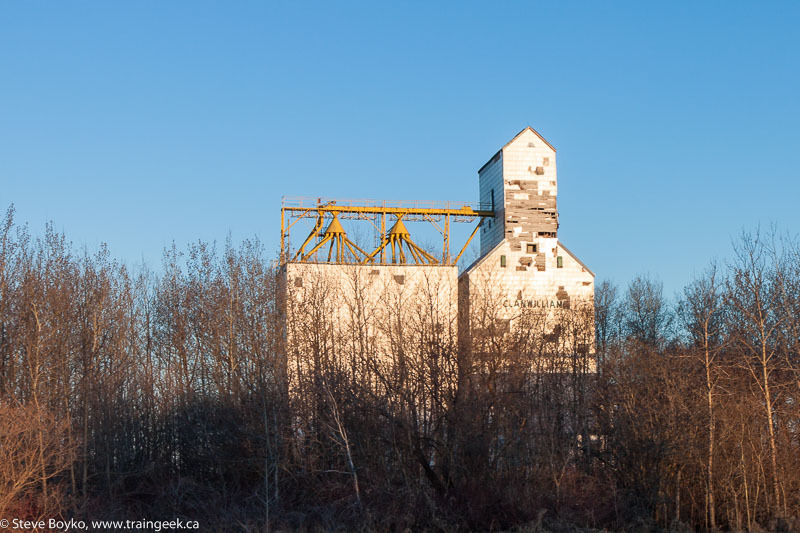 The Birdtail grain elevator was a wooden structure with no annex. It was labelled for Tanasychuk Farm according to old photos of the elevator. There was no sign of it, so I carried on. At least I caught up on some time! The grain elevator in Angusville is interesting. There is a garage attached to the elevator, where the annex used to be. I spoke with the owners - who moved here from Scotland a few years ago - and they don't know much about the elevator itself. It's not used and in fact the garage is blocking the driveway doors on the elevator. The office appears to still be intact. There is a pile of timbers out back that might be from the demolished annex. Always look back - you might get a cool view. On to Silverton and its very interesting elevator(s). 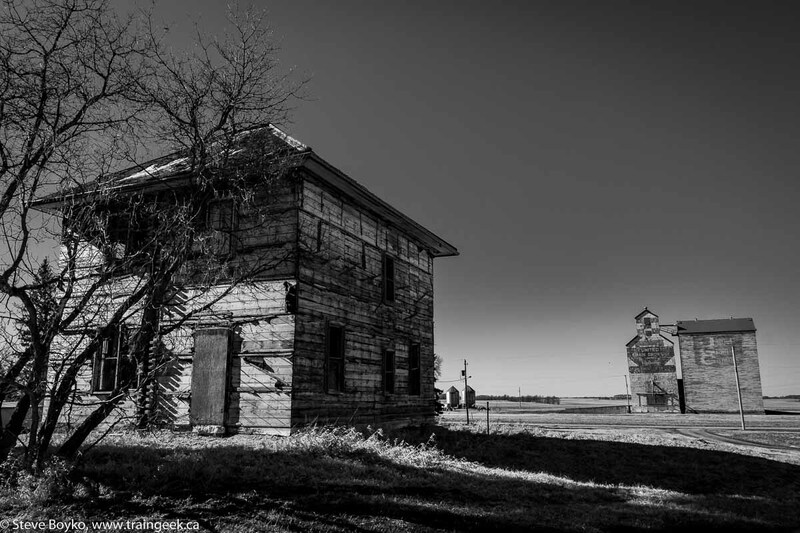 I had to stop and include this old house in the shot. It looks like someone was stripping the house down to its bones. 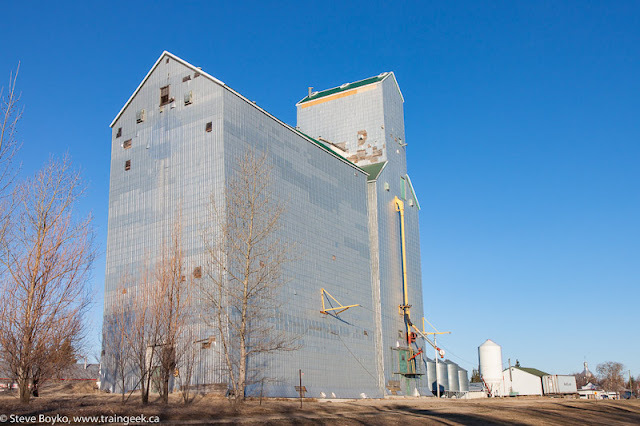 The Silverton grain elevator is obviously a former UGG elevator. 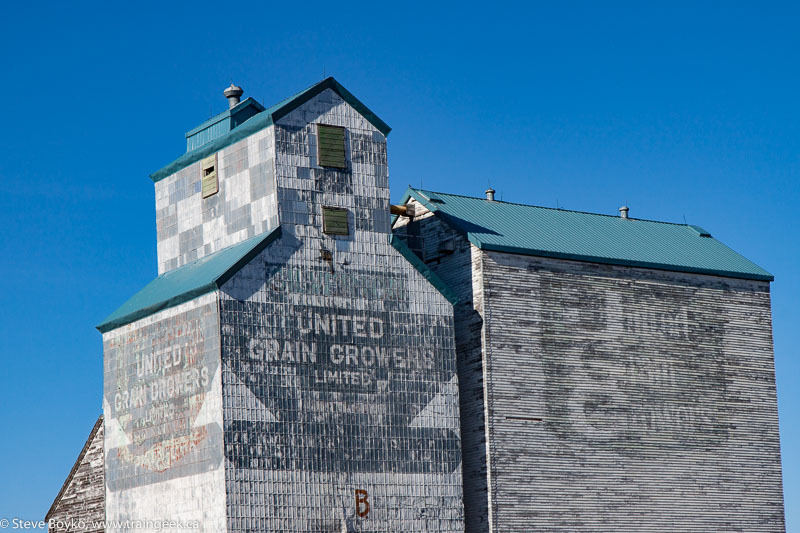 It wears its heritage proudly on the side of the annex and elevator. Note the "B" on the elevator indicating that there was an "A" elevator. 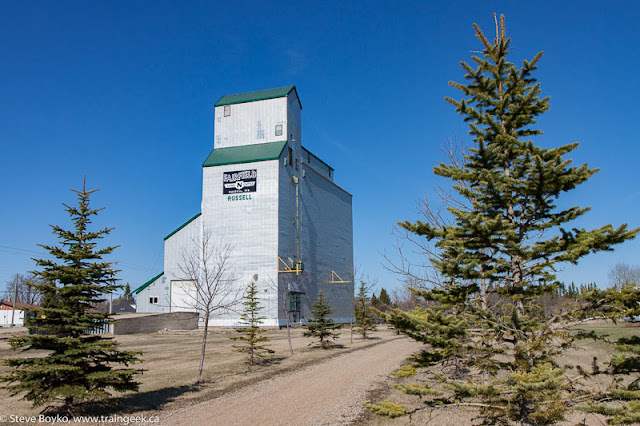 My guess is that the Manitoba Pool elevator that used to be in Silverton was the A elevator and this became the B during the six Agricore United years when the UGG merged with Agricore (itself a merger of the Alberta Wheat Pool and Manitoba Pool Elevator). I could be wrong. 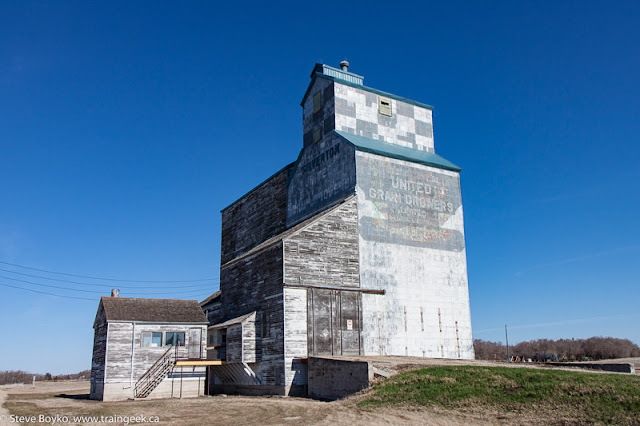 I really like the checkerboard look on the cupola of the elevator - very unique in Manitoba. 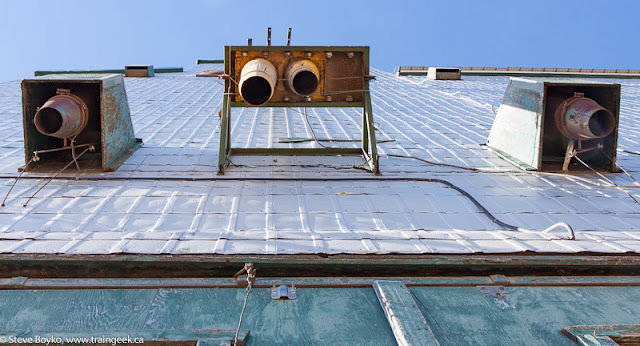 The elevator looks well maintained, with a new roof. 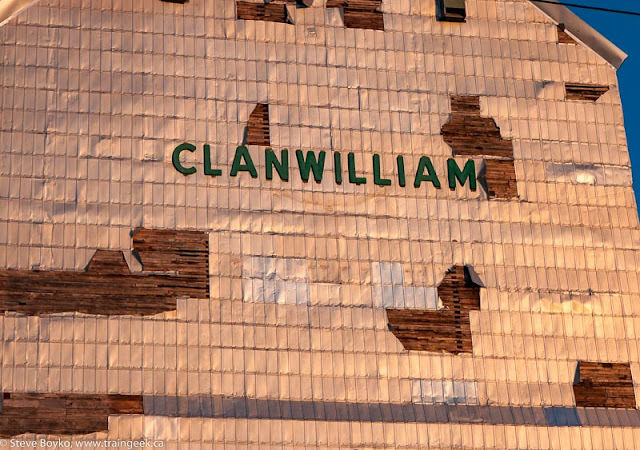 Hopefully it is still serving after so many years! As it happens, there are two grain elevators in Silverton. The second is on a nearby farm. I spotted it as I was driving out of town. 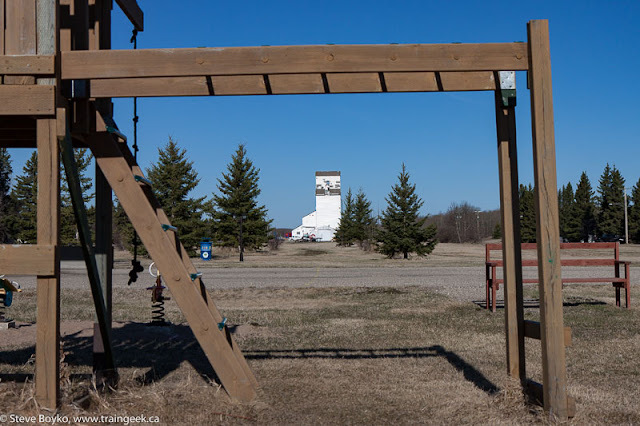 I took a few shots of the elevator from a public road but didn't get any closer, as it is clearly on private property. 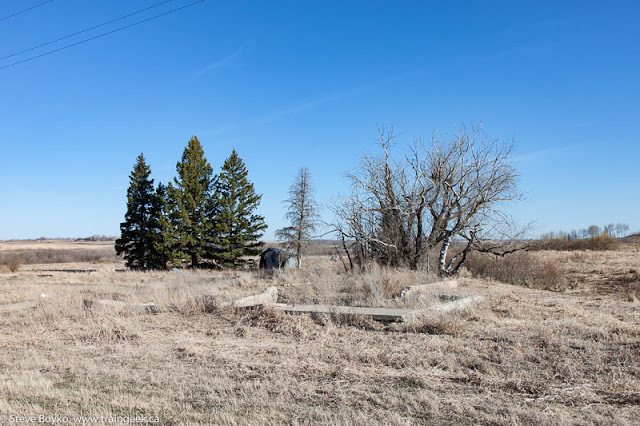 Anyway, on to the former terminus of the CN Rossburn subdivision, Russell. 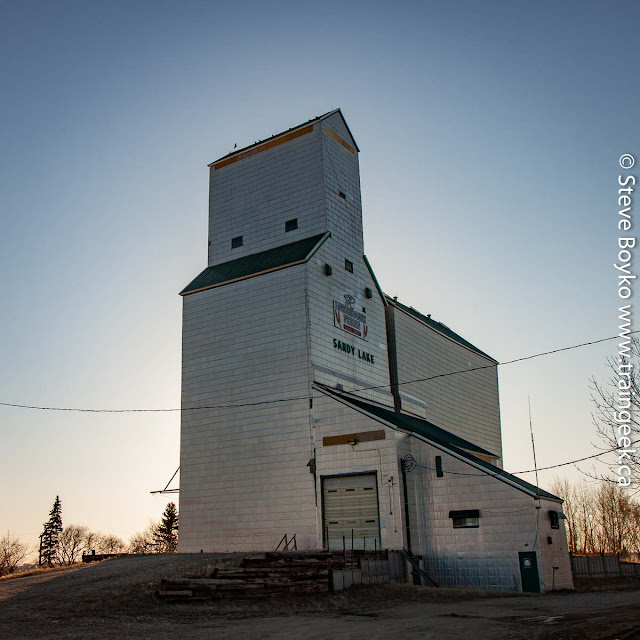 I arrived in Russell to find the ex Manitoba Pool grain elevator to be in fine shape. 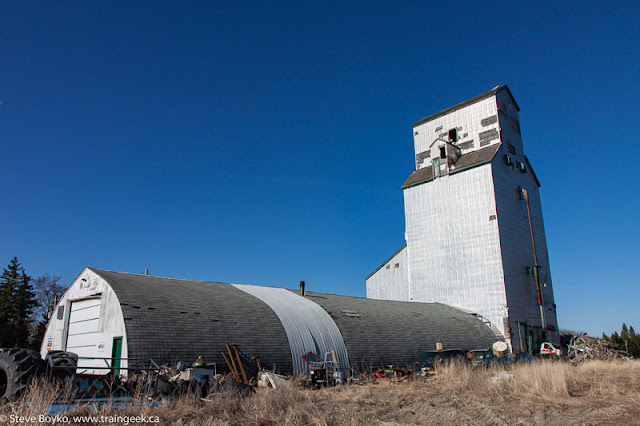 It is privately owned and apparently still in use for grain storage. 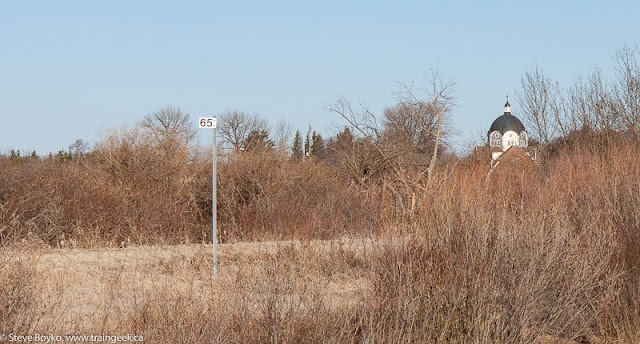 The Trans-Canada Trail runs along the former CN line here. 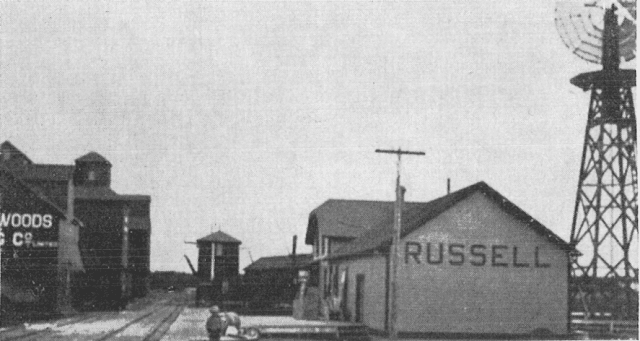 Russell used to be a division point on the CNR, with a roundhouse, station and so forth. 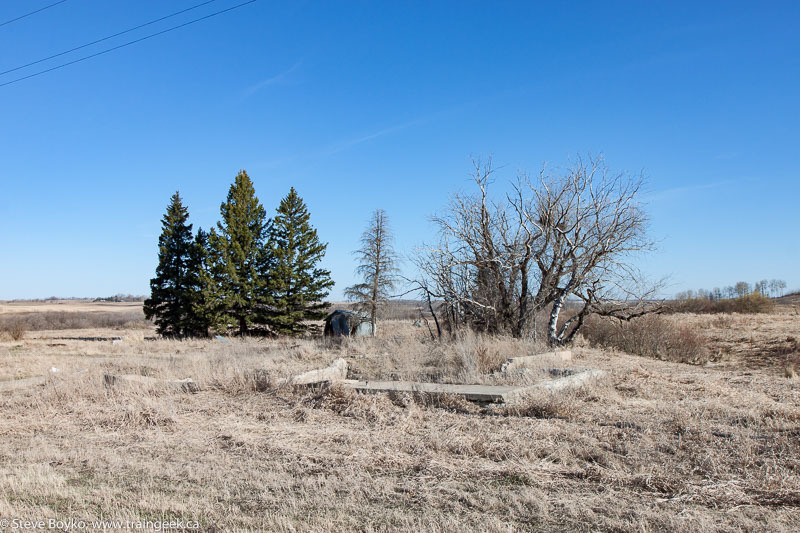 The CN Rossburn subdivision ended here in a yard, and the CN Tonkin subdivision continued on into Saskatchewan. Clayton Chaloner contributed his photo of a brace of GMD1s lifting the last loads from the Pool elevator in Russell. The CP had a presence on the west side of Russell with the CP Russell subdivision running from Binscarth to Inglis. 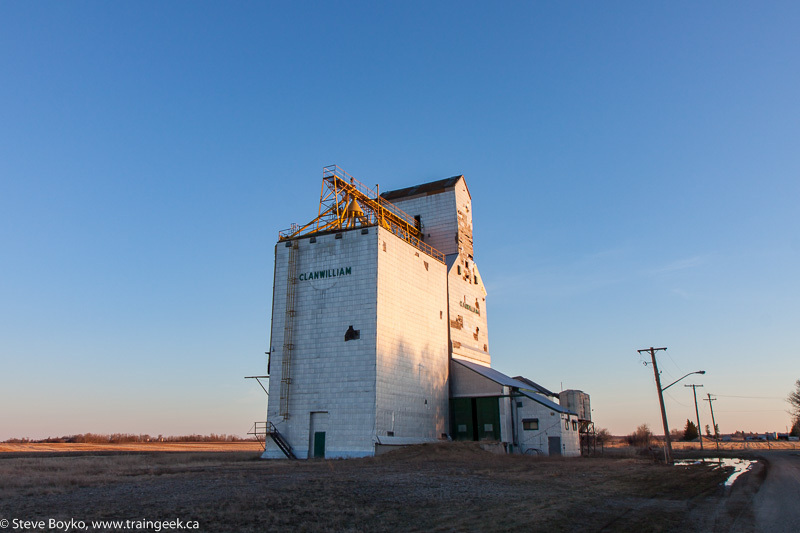 At one time the majority of the grain elevators were on the CP line but there are none there now. 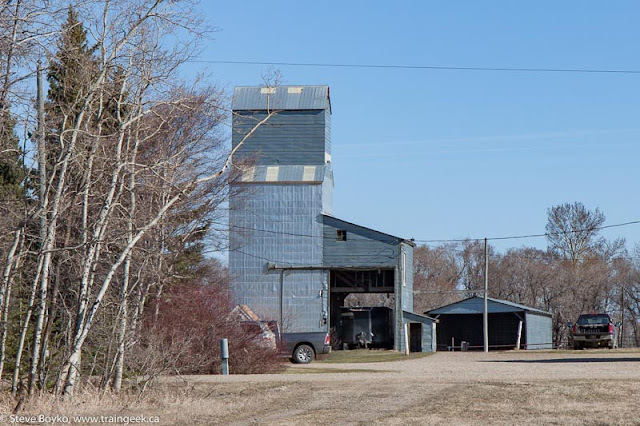 Russell is near the large Bunge plant in Harrowby, MB (on the CP Bredenbury subdivision) as well as potash mines in Saskatchewan, so it is a "happening" place. Speaking of the Bredenbury sub, that's where I went next... to Binscarth. Read on! Keep 'em coming, Steve. The elevators continue to disappear. Are you sure you didn't jump out of bed prior to this megaroadtrip? I would have. But, as you found, properly pacing yourself is important! Thanks, Eric! I may or may not have jumped out of bed early... I'll never tell. Steve the Birdtail elevator was burnt down a number of years ago by arsonists. The elevator was burnt first, and then sometime later the old store was targeted. If you are ever able you should walk along the old tracks north of Rossburn towards Birtdtail you should check it out. It's part of the Trans-Canada trail. When you enter the Birdtail Valley there is a huge fill that must have been a really impressive curved trusle bridge. The creek that runs under that fill is what plugged and threatened the whole valley a few years ago. There was so much water that if it let go they were worried that it would take out houses as far away as Birtle. The annex in Angusville burnt as well, or at least most of it. It smouldered for months. I think it may have been a controlled burn by the town as it was falling apart. Thanks for the updates on the Birdtail elevator and Angusville annex, Curtis. A lot of those early trestles were filled in to become fills.. I imagine it was quite impressive when it was built. Steve, when you posted that comment..."Leave the town by a different route than you came in, if possible. ".....I figured maybe there was something more going on, like maybe the town locals were stalking you and wondered who this "suspicious dude" is that is loitering around their backyards. But good advice nonetheless, always keep em guessing. lol Good post. Pipes on clanwilliam. ...one for hoppers one for boxes. 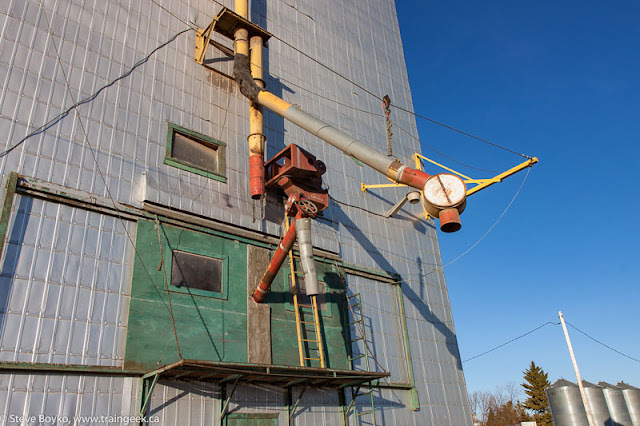 I worked for the farmer that used to operate the elevator and still owns it. Thanks for the confirmation, Jason, on what the two pipes were for. It's too bad the elevator isn't in use any more. Any idea when it was last used? Just posted 2 more sites you can add to your list of Rossburn sub sites even if they don't exist any more. Birdtail and Vista.